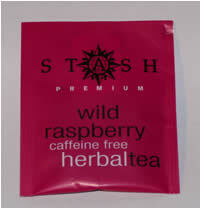 Summary : Someone who likes raspberries will definitely like this rather strong and colorful tea from Stash. Review : Having no expectations about a tea is a very good thing to have whenever you try a new tea. I've learned through painful trial and error that having expectations about how a tea will taste usually ends up disappointing me. So, whenever humanly possible, I approach all new teas anymore with no expectations whatsoever. True, thats the theory, and it doesn't always work, but at least when I tried the Wild Raspberry Herbal Tea from Stash, I can honestly say I tasted the tea with an open mind. Now, I'm not a huge fan of raspberries, admittedly. However, the tea (which was bagged) did have a nice aroma about it once I removed the tea bag from the foil container. And my hopes - yes, here they come - began to develop once I poured the boiling water over the tea. Almost immediately, the color of the tea turned a nice, rather attractive looking light purple. And by the time the tea got done brewing, the color of the tea was a rather dark puple. All good signs that got my hopes up for this tea. See how easy it is for theory to melt away when it comes to practice? So, what did this tea taste like? Well...how about raspberries. I'm not going to say it tastes like what a raspberry straight off the vine does, BUT, it still does resemble the taste of raspberries. Now, the reason the Wild Raspberry Tea from Stash probably doesn't taste strictly like raspberries is because what goes into it. The tea consists of hibiscus flowers, rosehips, orange peel, lemongrass, licorice powder, citric acid and natural raspberry flavors. One interesting thing about the teas flavor is that it is VERY strong. Many bagged teas I've come across tend to have rather light flavors, but not this one. When you drink this tea you'll definitely get the flavor full in your face - it is that strong. Moreover, as strange as it sounds, this tea is rather "heavy". Something about the rather strong taste of the tea also made it seem "heavy" in some fashion. Now, I personally didn't really much care for the flavor of this tea. Then again, it could be simply because I'm not a fan of raspberries. However, if you do like raspberries more than I do, I would suggest giving this tea a try. Recommendation : If you like raspberries, the tea is definitely worth a try, especially if you want a strong raspberry taste.